The pretty American Bittern above was clearly on a mission last week, stalking very close to the boardwalk. As I’ve mentioned in previous posts, this large Bittern is quite elusive, “uncommon and very inconspicuous,” (The Sibley Guide to Birds, 2nd Ed. ), so it’s always exciting to see one in full view, right near by. They can be nearly invisible when standing at a distance in the reeds. 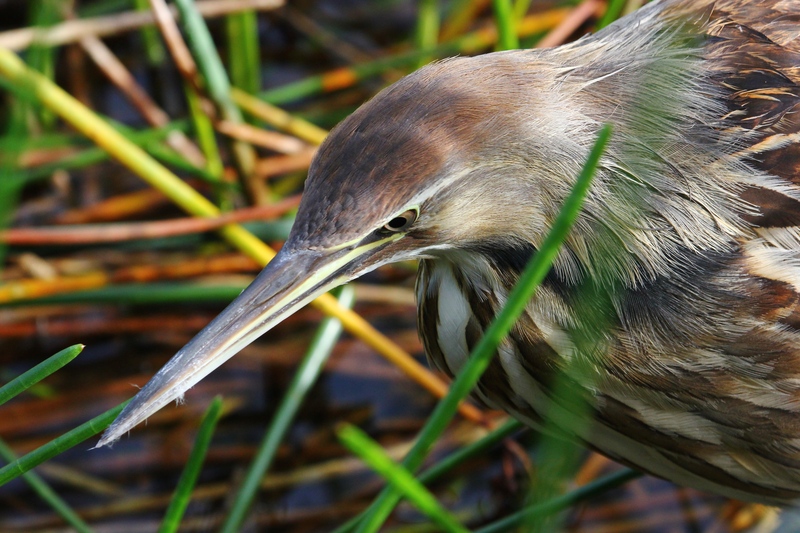 David Sibley talks about how the American Bittern’s “cryptically patterned plumage” (The Sibley Guide to Bird Life and Behavior), serves as camouflage to protect it from predators. 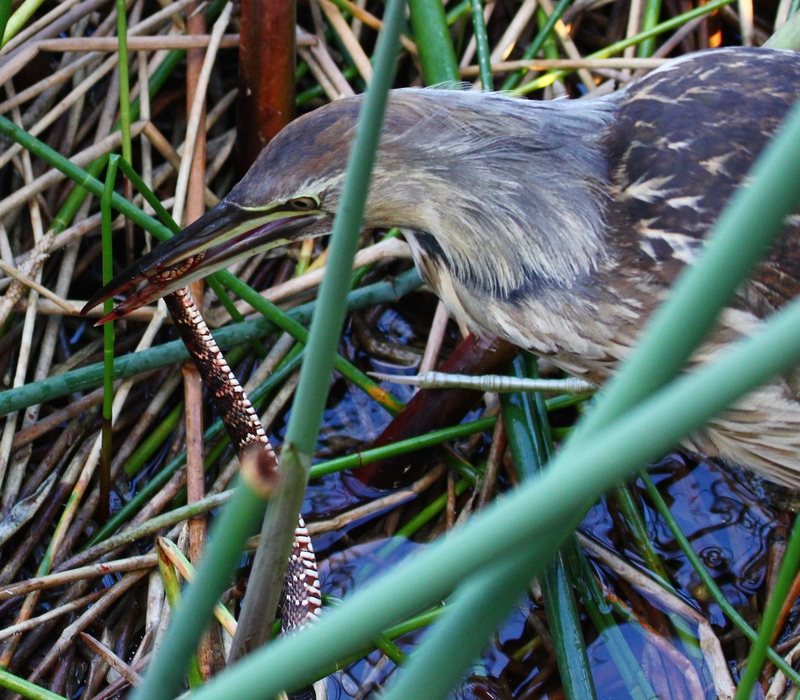 A few days later, I saw this encounter above – the Bittern was in the exact same spot as before, near the boardwalk, tugging with all his might on this snake in the marsh. A small crowd gathered to watch the ‘contest’ – bird vs. snake! High drama in the wetlands~ It seemed inconceivable that he couldn’t get a good enough hold on the snake to pull it up completely and devour it. But, as someone pointed out to me, the snake’s defense is to wind itself extremely tightly around the reeds and hold on for dear life. Thanks very much for stopping by, Boeta~ These birds are so fascinating to watch! I enjoy seeing your family’s ‘everyday adventures’! Yes, a really great place to visit – you must stop there when you are in Florida, H.J. It’s in Palm Beach County on the east coast – Green Cay Wetlands on Hagen Ranch Road in Delray Beach. Yes….These are two of the best and most popular sites for birding in Florida! Very busy during “the season”, but superb for seeing the large nesting wetland birds from now through at least March. Beautiful the rest of the year too! 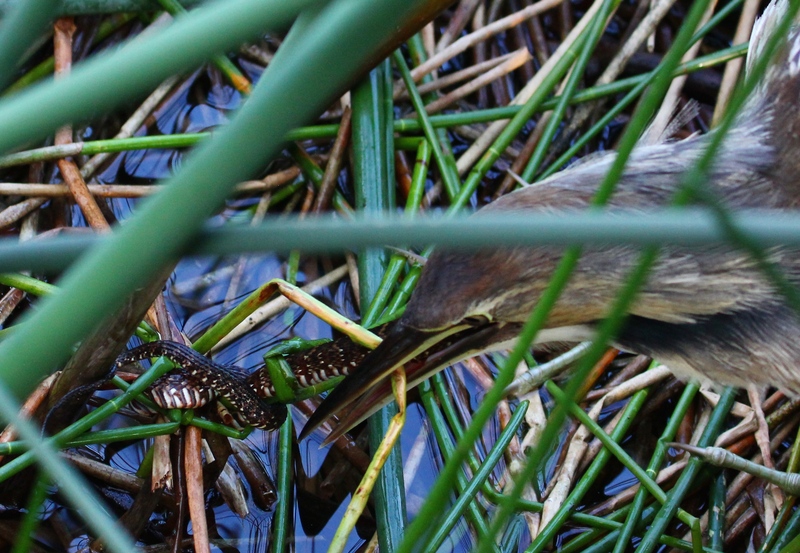 Great blog Lee, interesting to see a wader eating a snake, thanks! 🙂 np. Yes… A lot of avatars are similar. I’ve done the same thing! Thanks so much for your visit and kind words, Jet! I’m just lucky to live so close to these wonderful spots. Thanks for visiting and for your thoughtful comment, Calee!